I’ve mentioned this before in an update I did during some of my semi-hiatus time, but I genuinely thought that The Price of Smiles was going to be an idol anime. The way Princess Yuki looks, along with the only image I had seen at the time, really had me convinced. SPOILERS! It’s not an idol anime at all… it’s a mecha show about war. Not what I expected but that can be good, so, was it? Said image, featured on Karandi’s wonderful site. Be sure to check it out! I also mentioned this in my little update, though in not very much detail, that this was a palate cleanser that I was finding just enjoyable. That held true throughout the entire viewing experience. The Price of Smiles was never boring, but it suffered from being too short at only 12 episodes. As a result, a lot of stuff just kind of happens because the show has to get to its ending. A shame too, because this could and should have been a far better show than it ended up being. Don’t get me wrong, it’s not like The Price of Smiles had anything revolutionary to say, or even did anything innovative, but there was a solid show here. If this would have been doubled in length, it would have easily fixed a lot of the problems that resulted in this being such a short series. Namely, pacing and impact. I mention this because the ending falls short in a lot of ways. Things just get wrapped up because they have to and it all feels a little too easy. It takes away from what should be a meaningful moment for the series, causing me to not really care when it came down to everything. It was all going to work out of course, but the stakes weren’t quite there. It didn’t help that in the epilogue, brief as it is, doesn’t really show any of the stuff they were talking about leading up to the ending. Lives were supposedly changes, but it didn’t seem that way at all. It’s not all bad though. As I mentioned not too long ago in my collab with Yomu covering Art Club, sometimes an average, enjoyable show is exactly what you need. For a season that was jam-packed with excellent titles, having something like this to slot between watches was a much needed blessing. Taking all this into consideration, I don’t really have all that much more to say about the actual anime itself. 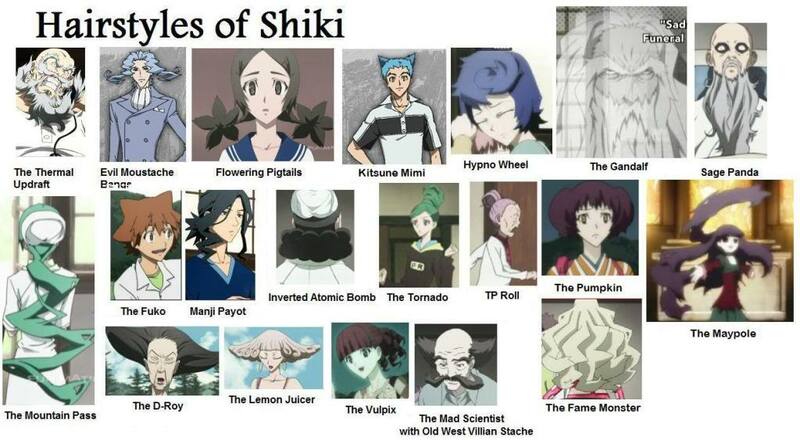 I suppose I could poke fun at the simply ridiculous hairstyles that almost rival Shiki in that regard but a picture is going to speak more than words ever could there. Beyond that, I suppose I should mention the OP, “Egao no Kanata” by Chiho feat. Majiko. I really like when things sync up well in OP’s and this has a shinning example where Yuki and Stella sing part of the song back-to-back. It is super good! There was actually quite a lot of great imagery in OP’s this season but that’s a topic for another time. For better or worse, The Price of Smiles was just a pretty average show. A Pretty average show that I would fully recommend, especially if you are a fan of mecha stories about war. That’ll do me for this one folks, see ya in the next one! What were your thoughts on The Price of Smiles? Did you think it was going to be an idol anime like I did? I’d love to hear your thoughts in the comments below. While you’re down there, tell me what your favorite mecha anime is too! If you would like to support my writing, please utilize my donation button below. I’d greatly appreciate that! As always, thank you so much for reading and have yourself an excellent day. Real talk guys. As some of you may know, I finished University at the start of the summer and have been looking for work. I used to have a pretty great job, but they couldn’t keep me once I was no longer a student. Long story short, I haven’t had much luck in finding a job. Please take a moment to read this and spread the word as much as possible. Jon Spencer Reviews started out as a passion project in 2015. I wanted a platform to discuss, share, and critique the various things that I enjoy. We started off with just me. I primarily did anime and board game reviews. Since then, there have been over 300 articles written by myself and contributors and growing! It all started off with an article series I did for the anime Last Exile (which you can view here). There have been some truly fantastic people who have worked with me, for absolutely free, on the site. Some of you may know Jacob, and more recently Frank, as they are currently active contributors. We’ve had other writers who have since moved on such as Dana and Origamillama. No matter how large or small the contribution, these wonderful people who have (and ever will) given to Jon Spencer Reviews their time, work, and dedication I thank you. The site has also undergone some major improvements since we’ve started. I have a custom banner, added more advanced and useful features to the site, and much more! I hope to be able to continue bettering the site as we move forward. Truly, this has been one heck of a ride so far. This brings us to today; I am in need of your help. I sincerely cannot find a job that will work for me at this current juncture in my life. This may seem a bit sappy, but I was born with something called Cerebral Palsy and as a result some aspects of day-to-day life can be difficult for me. One of these things is driving; I just can’t safely do that. Unfortunately, the transit system where I live is not very accommodating and there are a variety of other factors related to my Cerebral Palsy that have prevented me from considering moving very far a viable option. I’m taking a risk by asking that you help support me. One of my close friends, Mrs. K (for those who may recall her), said that I should try turning to this site to earn a living. I understand that this may be a big ask, and it’s a huge step for me to take, but I’ll never know if I don’t try. Writing is an ideal job for me, so maybe this dream really could happen. Don’t think that I’m just asking for your money because I’m not. In exchange I will work my hardest to produce quality content that will be available to everybody, regardless of if they support me or not. A percentage of the money will be distributed to my contributors as well, regardless of how much, or how little that is, because without them I would not have seen nearly as much support as I do now. Money that I don’t need in order to exist will be used to help the site. This may mean something as big as making a YouTube channel at some point, but right now I just don’t know yet. Being a Patreon of mine means that you will pay me the amount of money that you pledge each month. You can change the amount or cancel at any time though. I don’t want anybody breaking the bank on my behalf here. Along with the reward tier chosen, Patreons will have a greater say regarding the direction of Jon Spencer Reviews, access to special content (that will eventually be made free to everyone), and more. I’m new to Patreon, so some stuff may change as we go but I think this is a good start. For the first 30 days, so from 8/17/17 to 9/16/17 anybody who supports me on Patreon will also be helping out fellow blogger Karandi at 100 Word Anime. As part of Patreon’s referral program, by supporting me, Patreon will also give some money to her as well. Karandi has been a HUGE supporter of mine and I wanted a way to give back, so this is my way of doing so. It doesn’t cost you anything extra, won’t negatively impact what is donated to me (in fact I get a bonus! ), and is a great way to help somebody else out at the same time. We need 30 people minimum to pledge their support for me in order to receive the benefit, but I know we can do it! Even if you can’t donate, or don’t want to, please share this article to as many people as you can. Twitter, Facebook, email, etc… anywhere you can think of. It would be extremely helpful and I’ll be forever in your debt. There’s a chance that my dream to make writing work for me will fail, but I know with your continued support that we can make it happen!